This discovery of human remains in a vacant home on a First Nations reserve outside of Prince George disturbs me. First of all, we know it's drug related and we know who runs the drug trade in Prince George. When it says human remains were discovered that usually means one of two things. Either the body was there a long time and had decomposed leaving skeletal remains or someone had cut up and dismembered the body. Two elements of the deranged pattern of drug related violence that I see are torture and dismemberment. At the trial of contract killer Mickie (Phil) Smith the court was told one of his murders was done for the East Vancouver chapter of the Hells Angels. Smith killed Paul Percy Soluk at a crack house in Surrey and said a man he called Yurik helped him chop up and dispose of the body. Smith said "Yurik's not an Angel but he works with the Angels. I know he's done a lot of hits." This case is the smoking gun so to speak. 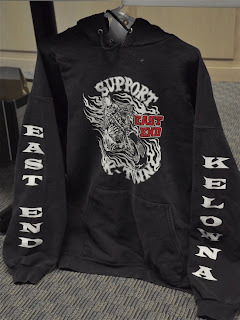 It directly ties the East Vancouver hells angels to murder in a Surrey crack house where the body was chopped up afterwards. Smith said Yurik helped him chop up the body and that Yurik has done a lot of hits for the hells angels. Is that so? How many of them has he chopped up? A lot of people are asking my why the police have refused to release the details on the details of Britney Irving's murder and the condition her body was found in. Several sources claim she was found chopped up stuffed in a barrel. True or false, the manner of her murder needs to come out at Joey Verma's trial. It appears that the pretrial has completed and now they are preparing for the full trial. We know that Jody Elliott's remains were found in a wooded area on Kelowna's Westside back in 2005. Witnesses said that word on the street was his murder was designed to send a message to Kelowna's drug culture. A shovel and an X-acto knife were employed to remove the victim’s head, hands and ear. A police officer acting on a tip intercepted the trio as they headed back to Kelowna on Bear Creek Main Road in a car that contained Elliott’s body parts. Back at the Kelowna RCMP detachment, an officer discovered Elliott’s ear in Fralic’s pants pocket. Let me pause for one moment and reiterate how deranged this single case is and how often this deranged pattern has been repeated. The first disturbing accounts we hear of victims being chopped up and disposed of were on the Pickton farm. One of those murders was also tied to a Surrey crack house known as the Surrey House of Horrors. One of those victims was also tied to the Orange Number Five in East Vancouver. Cutting up a body after they have murdered the person to dispose of the body is one thing, torture in another. Cutting off someones ear while they are alive is something that I would consider torture. Cutting off someones privates while they are alive is something I would consider torture. Cutting off someones privates after they are dead is psychotically deranged. Apparently, the sexual abuse in the Paxton case has not been limited to the Paxton case. Which brings us back to torture. We know they tortured people in the Surrey House of Horrors. Garry Harder was tortured and electrocuted there for $300.00. His girlfriend was made to watch and "they" tried to force his girlfriend into a life of prostitution to repay the debt. We know the police found crack addicts chained in crack house basements in Prince George who were being tortured for crack debts. This is a very disturbing pattern of torture and abuse tied to Surrey and Prince George's drug and prostitution world run by we all know who. Enough. VANCOUVER — Months after being acquitted in a shocking mutilation and torture case, two Vancouver-area men have been arrested again and charged in another violent kidnapping. Jesse John Margison and Troy Dax McKinnon were picked up Friday night by the Gang Task Force and charged with kidnapping for an organized crime group, assault with a weapon and assault causing bodily harm. Both Margison, 26, and McKinnon, 29, were freed last April after more than two years in jail charged with the brutal kidnapping and mutilation of Robert McMillan in July 2007.